The operating model is a key process for an organization to deliver values to their customers. This page offers you a guide on how to design a logical operating model canvas. The operating model is a fundamental part of business strategy which aims to build a bridge between strategy and operations. With help of this model, this operation team delivers the value of organization to customers. It contains 6 elements including Supplier, Location, Process, Organization, Information and Management which can be abbreviated as POLISM model. 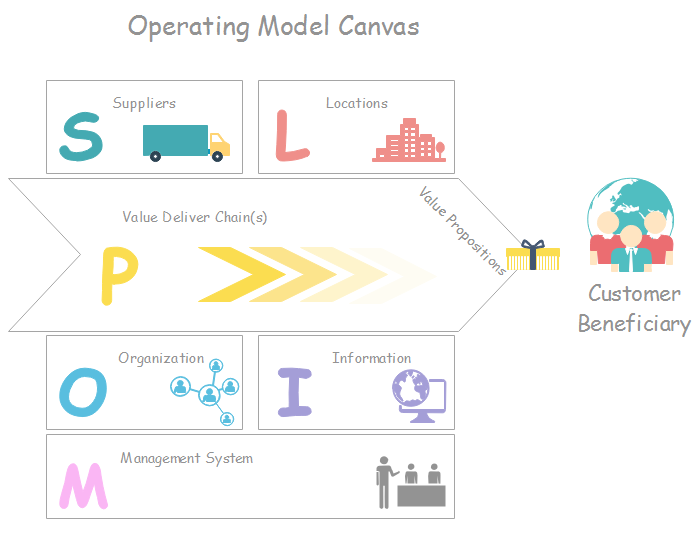 The operating model canvas converts an ideal strategy into practical choices about operations of the organization like a start-up, a single-business, a collection of businesses, a charity, government department, a firm and a company etc. The process in operating model shows detailed steps of an organization delivering their core value propositions to customers and beneficiaries. With those steps, an organization are not indifferent for customers but closed to them. The most practical analytic apprach in process stage is value chains which should be analyzed thoroughly. Organization contains people in the organization, structure of organization, relationship inner organization and organizational behaviors. There are many strategies analyzing the organization like flatter organization, hierarchical organization, flatarchies and holacratic organizations. Location is significant in operating model because it depends on where to work and surrounded environment. Choosing a location sometimes determines the degree of recognition and satisfactory of customers and beneficiaries. Location can also influence the required assets and their budgets when delivering the values to customers. Information system plays an important role of supporting the operation. It can be used to collect, store, distribute and communicate massive data rapidly and applied in organization. It is automatic so that it will offer accurate information with high speed. This system save times for users which make the delivery process more efficiently. When mentioning supplier, there is one process could not be forgotten which is logistics. Suppliers of the organization offer input and bring to the organization under supply chains. How to deliver to the customers sometimes settles the initial image towards the organization. The whole network of supplier and logistics is quite crucial in operating model. Management system covers the integration of most pivotal issues of management like performance management, financial management, risk management, planning and strategic management etc. The whole procedures are running through within an operating model to control the details. The following steps are shown at length to design an operating model by a user-friendly diagramming software - Edraw Max. Before guiding, I suggest you to check whether the templates we provided can be used or not. Step 1 - List basic questions to be solved toward the operating model. If you are in an operation team, you should ask yourself some elemental questions about the operating model to have a deep understanding of what your organization really wants to deliver. Questions are shown as follow. Step 2 - Set the layout of your operating model. Go to the Page Layout menu, you can adjust and modify page setup, themes and background and choose one from the pre-defined styles. Drag the layout gridlines to set the margins of the page or divide the page into sections for accurate placement of texts and images. Click Text under Home tab. When the cursor turns to Text mode, draw text boxes on any place of the canvas. Adjust the size, color and alignment by clicking the relevant menus under Home tab. Open the libraries of symbols from the left side bar. Drag-and-drop selected cliparts to the canvas. Customize what you insert conveniently with the following operations - rotate, fill, size, align style and layer etc. Step 4 - Extend the operating model by inserting pictures, tables, hyperlinks, notes & attachments. You should expand the model with detailed plans and extra resources by inserting pictures, tables, hyperlinks, notes & attachments. Click each element under Insert tab like Picture from File, Vector Text, Hyperlinks, Attachments, and Note. Adjust with right side-bar tools. Step 5 - Export, share and print the operating model. 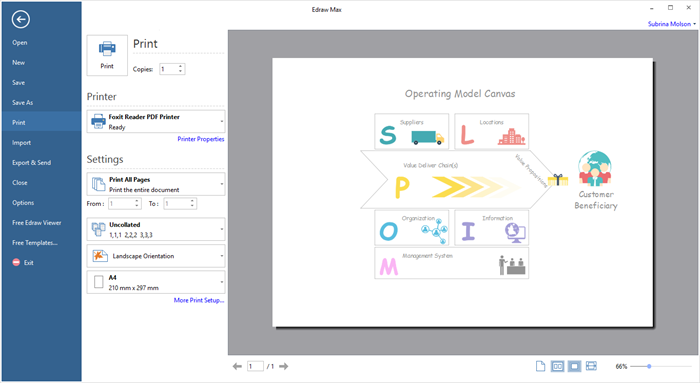 After ending create the operating model, you can export and save it to various formats such as JPG, PDF, office file, SVG, Visio etc. You can share what you draw and collaborate with team mates whenever and wherever you need to discuss with them. A preview of your document automatically shows under Print function. If the drawing page is larger than the print paper, your work will be printed on more than one paper. To print it on only one paper, click More Print Setup... and then choose Fit to 1 sheet. Till now, you might grasp the method of creating an operating model. I guess you cannot wait to use Edraw diagramming software. Get a free trial now.